Leia o texto e escolha as alternativas corretas. There have always been students who wished Shakespeare had written shorter plays so that they could get home from school earlier. The Reduced Shakespeare Company is just what those students had wanted. 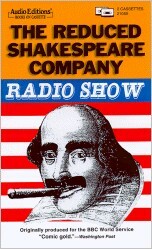 The RSC is an American comedy theater group that takes Shakespeare's plays and turns them into very short stories. For example, they can do Romeo and Juliet in five minutes, Hamlet in three minutes and Macbeth in two. Besides Shakespeare, the group now performs reduced versions of western history, the Bible, and the works of Charles Dickens. They often appear on stage in London and New York. A. ...it turns Shakespeare's plays into comedies. B. ...it reduces Shakespeare's plays to very short stories. 2. The original Shakespeare plays last longer than a few minutes. 3. The RSC performs reduced versions of Shakespeare plays exclusively. 4. RSC .......... Reduced Shakespeare Company.